Built 1898-1900 by Hermann Stadler and Emil Usteri for Saalbaugesellschaft Zürich. 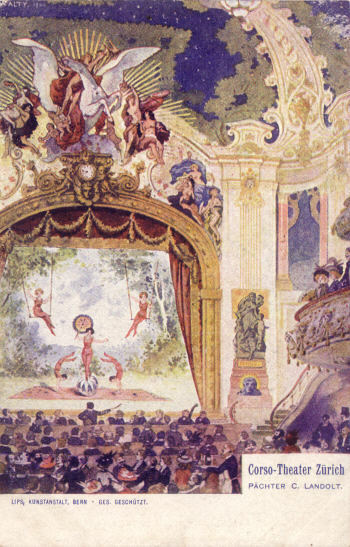 Opened 17 Apr 1900. Used as a variety theatre. 1933-1934 major rebuilding by Ernst F. Burckhardt und Karl Knell (1300 seats). 1941 auditorium rebuilding by H. S. Herbst and Emilio Vollmer. 1947 converted to a cinema by Carl Winteler, reopened 1 Nov 1947 (750 seats). Subsequently only occasionally used for live theatre. 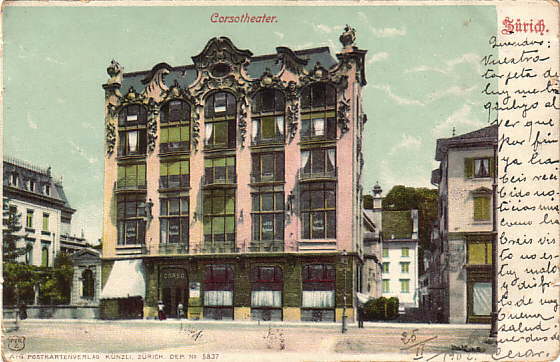 Front Text: "Zürich - Corsotheater"